Are you planning your wedding? Thinking of hiring a photographer, but are unsure of how to choose the right one? Here is a wedding photography checklist to help you in interviewing and selecting a photographer. You may also be looking for a wedding photography pose list. Wedding photography checklist item #1 deals with the subject of money. Don’t expect champagne on a gingerale budget. It is perfectly understandable that not everyone has a large budget for wedding photography. Just make sure that you budget and your expectations are in line. If you hire an amateur who does wedding photography "on the side," you cannot expect the same level of service and quality as if you hire a professional. (7) liability insurance in case something goes wrong. Photographers are usually comfortable working in one main style. You will be able to assess this by looking at their portfolio. Choose a photographer whose style reflects your own taste; don’t expect them to change their style drastically to suit your needs, or you may be disappointed with the result. Wedding photography checklist item #2 is all about style: the style you want for your wedding photographs. Traditional photography involves formal family and bridal party portraits, and photographs at pre-determined moments during the day (e.g., the exchange of vows, the best man’s toast, the father-daughter dance, etc.). Journalistic, or reportage photography is a more candid style of photography that has become increasingly popular over the last decade. 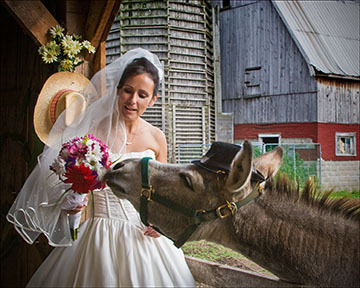 It documents your wedding like a news story, capturing spontaneous moments throughout the day. Fine art photography is an artistic style of wedding photography that emphasizes the beauty of the image, making each picture a work of art. What style of photography do you want for your wedding? You may want one of the above-mentioned styles, or a combination. For example, many couples choose an overall photojournalistic style, but still want a number of formal portraits included. I know it can be stressful, but do try to relax on the Big Day! A smile that reaches the eyes produces a much better picture. Okay, no pun intended, but you and your photographer do need to "click." Wedding photography checklist item #3 deals with personalities: yours and your photographer’s. Do they match? Make sure that, ahead of time, you meet the photographer who will actually be shooting your wedding, and make sure you feel comfortable with him or her. Choose someone you get along with and trust. You need someone you feel at ease with so that you can relax and smile beautiful, genuine smiles on the Big Day! Wedding photography checklist item #4 contains a series of questions you may want to ask the photographers you interview, to help you choose the right one for you (and do interview more than one, so you can compare!). Can I see some examples of your work? 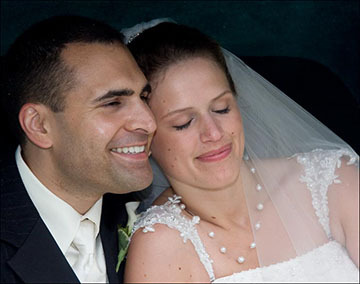 Ask to see some samples of complete wedding albums, not just a portfolio of the photographer’s best shots. It’s easy to get a few brilliant shots at a wedding, but you want to make sure the photographer shows consistency. What style of pictures will you shoot? This is an important one. You should understand whether the photographer’s style is more formal or photojournalistic, and make sure it matches your own tastes. If you want mostly photojournalistic pictures, but also require a few formal portraits, make sure you clarify that up front, too. Read more about choosing your style. Will you be the photographer who takes all the pictures? Sometimes, a larger studio may send a different person to shoot your wedding than the one you speak to. Other times, the main photographer will shoot the wedding, and leave an assistant to shoot your reception. Choose a solution you are comfortable with, and that fits your budget. What happens if the you get sick on the day? You need to have a contingency plan. Can the studio provide a backup photographer in case of such an emergency? How long will you stay? Do you just want the photographer there for the ceremony and a portrait session afterwards? Or do you want the photographer to spend the full day with the you, photographing preparations, ceremony, portraits and the reception? What you decide here will, of course, impact the budget. What locations will you cover? Will your photographer come to the bride’s house, the church, a park for portraits, and the reception hall? Come to an agreement ahead of time. Again, your decision may impact the budget. Some photographers have packages that include a certain number of locations. Can you make sure you take this picture? If there are any shots you really want, you need to let the photographer know about them ahead of time. Perhaps you want a picture with your best friend, or your grandma. Or perhaps you’ve always dreamed about a shot of your bridal gown draped over a chair. If you don’t communicate this, it might get missed. Provide the photographer with a written list of these must-have shots. You can use this wedding photography shot list to check off the shots you really want. Work with the photographer to make sure you are realistic about the number of shots you want, and the time available. Use sample shots as a common language for communicating ideas that you want to replicate. What do we get in the end? How many shots does the photographer expect to take? Will you see proofs? How will they be provided? On the web? Via CD? How many final images will you get? Will you get digital images, or prints? Will prints they be put in an album, a photo book, or provided loose? Will the final photographs be retouched? All this is open to negotiation, and the photographer will usually have several packages to choose from with different options and price points. Understand what you’re getting. When do we get it? How long will it take the photographer to provide proofs? How long you you have to make your final selections? How long after that will the final images be delivered? What are your payment terms? When does the photographer expect to be paid? Usually, you are required to put down a deposit to hold your booking. Then, the photographer may expect another installment on the day of the wedding, and a final payment when images are delivered. Terms will vary. Make sure you understand them. If you expect the photographer to shoot all day, and stay for the reception, you will also want to clarify whether you will provide a meal, or whether you will allow your photographer a sufficiently long break to go and get a meal. You must do one or the other! Photographers need to eat too! Wedding photography checklist item #5 deals with the contract. No wedding photography checklist would be complete without mention of a contract! You may think of contracts as formal, wordy and cumbersome, but they are absolutely essential! They protect both parties in case of disagreement. A contract is actually a great way to make sure that communication takes place. Formalize your answers to the questions in wedding photography checklist item #4 above with a contract that lays out everything you’ve discussed. A professional photographer will have a contract to show you. Read the terms carefully. You can negotiate them. Be Kind to Your Photographer! Sole hired photographer. Your photographer will want to insert a clause in the contract to state that they are the sole hired photographer. This is to prevent the challenges that occur with two sets of flash bulbs going off during the shots, or people not knowing which camera to look at (it is very disturbing in the final image when people’s eyes are looking in different directions). Also, part of what you are paying for is your photographer’s creativity in setting up a shot. It is not fair to have them do that work, and then buy that image from a second photographer who is there shooting. The clause in the contract is usually about a second hired photographer. However, you can also help a lot by keeping Uncle Bob from getting in the photographer’s way and causing the same kinds of problems. You’ve paid for a photographer. Let him do his job effectively. It will result in the best images. People finder. It will help your photographer tremendously if you can ask someone at the wedding who knows the majority of the "key players" to assist. Their job will be to round up the people who are needed in upcoming shots. A lot of time is often wasted searching for Aunt Jane or the flower girl because they’re needed in a shot. Everyone (including you!) wants to get to cocktail hour, so don’t have your photographer waste valuable time searching for people he doesn’t know. This is the perfect job to keep that busybody aunt occupied! No surprises. Of course unexpected things happen at weddings, and schedules almost always slip. However, don’t spring any last-minute surprises on your photographer if you can avoid it. We don’t want to hear on the day that the ceremony has been moved up an hour. Nor do we want to be handed a list of 20 "extra" must-have portraits at the last moment. Such things must be discussed ahead of time, as they will have a significant impact on the schedule. Follow the plan. Your photographer will have a wedding photography checklist too. If your photographer comes up with a plan to group certain shots together for efficiency, try to stick to it. If you’ve discussed a plan to do certain shots at the ceremony location and some at the reception, try to stick to it. Stay on time as much as you can – it’s usually the photographer’s time that gets eaten into when schedules slip, and that will affect the number of pictures you can reasonably expect to get. It’s understood that some flexibility is required on the photographer’s part. Where you can, though, stick to the plan! You may want to view the wedding photography pose list. Photographers may want to review the wedding photography checklist designed for them.